Packing: Packed in plastic bag with fiber fabric outside. N.W. :20kg, or paper and plastic compound bag, N.W. : 25kg. *Designed for fire resistance, FARIDA TBC is a widely used new additive brominated flame retardant with excellent characteristics such as good effectiveness for flame retardant, low volatility, nice compatibility, durability, lightfastness, water resistance and non-toxicity. *FARIDA TBC provides highly effectiveness on polyolefin, PE, PP, PVC, PS, foaming polyurethane, polycarbonate, ABS, unsaturated polyester, poly methyl methacrylate, polyester, a variety of products such as synthetic rubber and fibers, etc.. Packed in plastic bag with fiber fabric outside. N.W. :20kg, or paper and plastic compound bag, N.W. : 25kg. Stored and transported as non-toxic and non-dangerous goods. Beware of dampness. 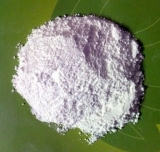 Solubility Insoluble in water, alcohol, cyclo-alkanes; slightly soluble in carbinol; soluble in organic solvents such as acetone, benzene and toluene, etc.. Performance Stable at storage. Good compatibility with plasticizers and other additives.